Here's a link to the Rock Hoppers Brew Club By-Laws. We haven't incorporated as yet, but the by-laws were put into place early last year just in case. If you don't mind me asking - how did that happen? Was it a case of someone(s) acting like "Rule Cop" and making everything about sticking to the letter of what's written? we had a private thread on our forum for the by-law committee and the board to discuss by-law changes and the board members couldn't agree on a couple of the changes, so we decided to present them all to the general memebrship for a vote and let things fall where they may. a couple of the board members thought that didn't go far enough, so at the meeting, three of them resigned and they started a facebook group, "non-club" club and registered with the AHA. 1. we have no by-laws. 2. we have no scheduled monthly meetings. 3. we do not collect dues. 4. all decisions will be made by all memebers. 5. we are here to have fun, and spread the enjoyment of the hobby! we will or will not add to this list as we feel necessary. to be fair, we did stick to robert's rules of order regarding club matters, but only because we thought that was best for the well-being of the club. we are going to have our regularly scheduled monthly meeting to see what members we have left, but expectations are not high. in the ultimate bit of irony.......the new club actually literally STOLE our by-laws! they changed the title of the club and added a sgt. at arms and absentee voting and the whole document is the same! Hopefully this gets found by all you original posters! Our club is going through a similar transition that some of you described in that we generally a drinking/sharing social once a month with the occasional competition or speaker. A few of us are putting some bylaws together and will definitely be looking through the posted ones. I'm curious how the transition went for you all and what your group looks like now. At this point we are just going to have a more organized calendar and leadership time. We are going to have a formal training/speaker/peer review at the beginning of each meeting as well as the social aspect. Do any of you have advice or were surprised at how well or poorly something went? Anything you can provide would be great as we are starting to put this in place over the next 3-4 months. Thanks all and cheers! 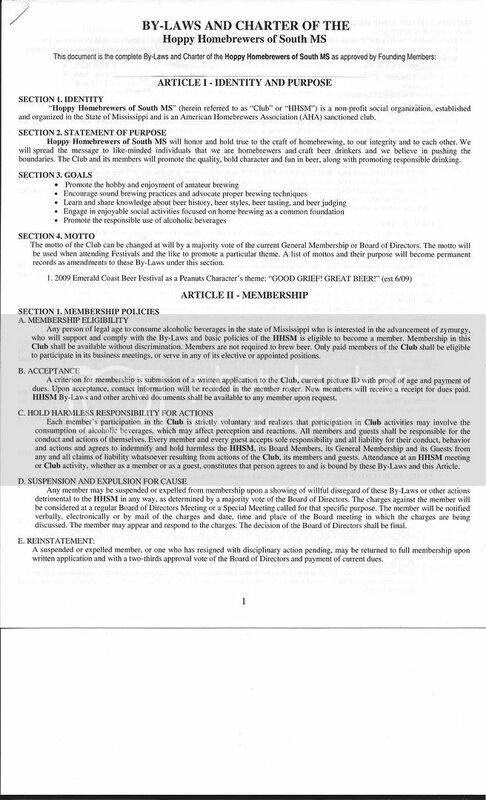 My club the Manty Malters (of Manitowoc, WI) basically plagiarized the Falcons' constitution and bylaws a couple of years ago. Since we were already doing most of the stuff in it, the club didn't change all that much as a result. If you are newly adopting some things within it then things will change more. For the good or bad, who's to say. Personally, I prefer social aspects and think we have way too much business at our meetings -- it takes friggin 90 minutes to get through all the business. I'd prefer to have a 20-minute business meeting and set committees to work on the finer details. But I'm not the Pres and I never want to be, so I guess it is what it is. Each club has its own dynamic and quirks, and that's fine. It's always a great idea to visit neighboring clubs to see what ideas you can steal from them, including ways to improve or maybe even to scale back if your club is overly social or business or whatever. Is your club collecting dues, incorporating as a formal entity, or so large that having designated leadership is necessary? If none of those apply you probably only need a basic framework for electing leadership and their responsibilities. Anything beyond that might be creating solutions for problems that don't exist. If you need bylaws for one of the reasons above then you really need to think about how little needs to be in the bylaws. The bylaws should contain what is legally required in your jurisdiction, what minimal architecture is necessary to administer the organization and any other rules that need to be durable enough that it takes a large membership vote to change them. Anything else can be administered through separate policy documents more easily changed as needed.